Last week, Guy in a Cube shows how to configure Active Directory Federated Services (ADFS) and the Web Application Proxy (WAP) role in Windows 2016, so that you can connect from Power BI mobile to SQL Server Reporting Services using OAuth. See the video, it’s very interesting. New dashboard tile actions (All): To access this menu, just tap and hold on a tile in a dashboard, or tap the ellipsis (…). 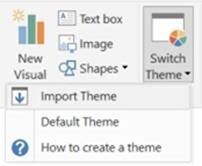 The menu allows you to navigate directly to the underlying report, expand the tile, or even manage an alert for the tile if the type supports it. SSRS – multi server support (iOS): you can connect to up to five different SQL Server Reporting Services servers at the same time. All the servers you connect to will be available under the settings screen. Scrolling Improvements: added the ability to scroll in any Cartesian chart (Bar, Colum etc.) by touching the chart itself, rather than touching the scroll bar. This new interaction is available in any visual in a report, report focus mode, phone report, or Q&A tile.